Amyotrophic lateral sclerosis (ALS) is a degenerative motor neuron disease that causes paralysis, motor dysfunction, and death. The scariest part of it is that while medical researchers have identified some risk factors for the disease, no one really knows what causes it. And there’s no cure. Yesterday I was nominated for the ALS Ice Bucket Challenge to either donate $100 to the ALS Association for research and awareness, or else dump a bucket of ice water over my head to celebrate healthy motor neural function and hopefully get people thinking and talking about ALS and medical research. In celebration of the fact that just two days ago, the FDA approved the Mayo Clinic to go ahead with Phase 2 of its trial of BrainStorm’s NurOwn, an adult stem cell transplant treatment that will hopefully safely and efficiently promote motor neuron growth and reestablish muscle-nerve connection, I’m taking the challenge in a different direction. In light of all of the criticism I’ve seen (in articles, comments, tweets, and what have you), I thought I’d take a little time to explain why I think this challenge is a good thing. Firstly, because it’s working. Even though it seems like this is a challenge designed to give people a way out of donating while still presenting themselves as caring individuals, more people are donating than ever. In just a few weeks, the ALSA has raised almost $23 million, which is an unprecedented amount for what is usually their slow season. People aren’t just opting out, they’re donating too. So why not just write the check and keep it to yourself? Why also participate in the exhibition of it all? Because that’s what spreads awareness, and that’s what gets other people to donate. That’s why we have fundraisers and charity galas and walkathons and philanthropy events. It’s not because everyone who donates needs to be tricked into doing so – its because people are busy, and sometimes we need reminders. Sometimes we need a flashy viral marketing campaign to push something onto our collective radar. A lot of critics point out that this kind of attention will fade as another trendy charity stunt takes its place in the media spotlight, but I’m alright with that; other issues deserve our focus too, and what these social trends leave in their wake are individuals who know more, and hopefully, care more. And awareness isn’t just about money. Spreading awareness can inspire people to be more compassionate and supportive to those who suffer from the disease, and also to their care takers (if you click no other link in this post, click this one). The more you know about a disease, the more likely you are to recognize it when you see it. Hopefully, this challenge will inspire people to learn about motor neuron degeneration, the energy and support required for palliative care, and more. At a very base level, it can lay a context for recognition. Sometimes we need to hear about issues a few different times and a few different ways before we can turn that knowledge into something substantive, and sometimes that substantive action is only tangentially relevant. Perhaps a nonprofit worker will be inspired to initiate a new creative fundraising idea for another cause, or a student will be inspired to study neurological diseases. While this may just be slackitivism for some, spreading awareness is more than just a way to create the pretense of altruism. You never really know what’s going to move someone to action or how many times they need to hear a message before it sinks in. And there’s a bigger message in all of this. Funding for medical research is drying up across the board. The US government is cutting biomedical research and development funds. 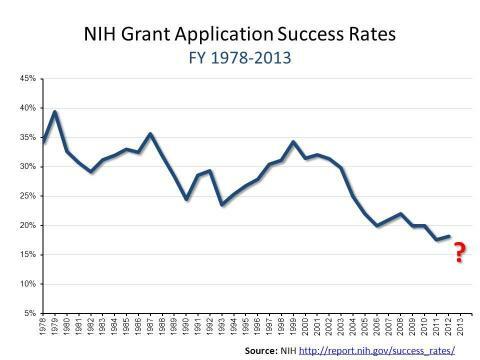 Academic grants are disappearing. If we want medical research to be a priority for voters, then we need people to care, and we need them to show it – even if the way they show it is a little silly. If you’re in a drought-affected area and don’t want to waste water, take care to dump your ice bucket over your garden and then shut off your sprinklers for the day, cut your shower time in half, make it the Ice Cup Challenge, skip the ice and use something else, or find another way to join in the conversation and keep the momentum going and the movement visible (like writing a blog post, for instance). And if you care about medical research and have the means, I challenge you to donate* to the ALSA, the Mayo Clinic, or a medical research institution you trust. *Disclaimer: I’m not an expert in charitable giving, so always do your own research before donating. It is a silly contest. That is why it works! Lovely article defending it. Sometimes it takes such a silly challenge to raise awareness, and funds. Sometimes you need a little silly to go along with your serious! Thank you for this! I knew there was some undue cynicism popping up around this but hadn’t been able to articulate why. Shared it on FB. Well said! I actually have no problem with people who donate trumpeting the fact. The outreach is outstanding, but if people also need the recognition to write the check, I say let them have it. Agree – you can’t have outreach without a little self-promotion. If everyone who donated stayed quiet about it, it would end with them.